The Platinum 2 Bike Freestand Rack comes equipped to hold 2 bikes with a patent-pending arm assembly that offers 3 dimensions of adjustment to accommodate any style of bike. You can Store up to 4 Bikes using the optional 33064 - Add Two Bike Kit (sold separately). 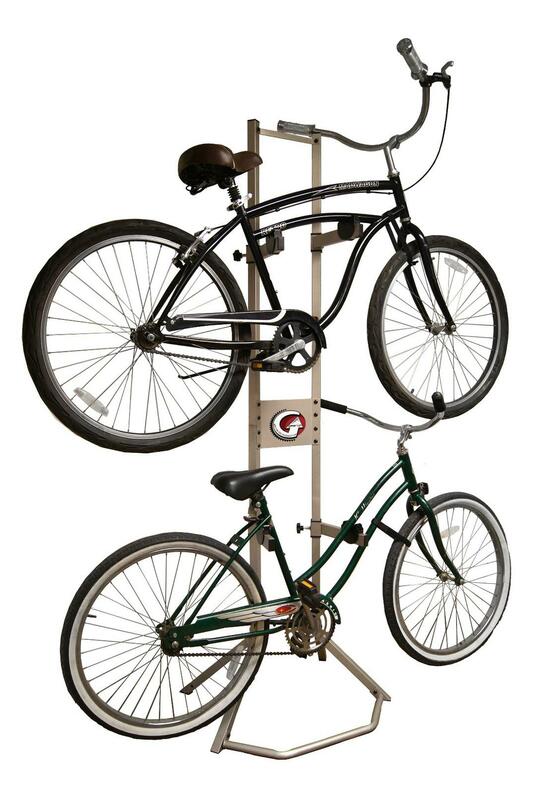 Heavy-duty powder coated steel tube construction resists scratches and rust and provides a strong dependable rack that has an industry best 200lb capacity. Overall height is 84". Rubber caps protect the wall and floor from unsightly marks. Specially designed rubber storage arms gently cradle your bike. Assembled dimensions 84" high, 30" wide, and 24" deep. Weighs 22 lbs.